The Pozzo Tre Pile Masseria dates back to the eighteenth century. 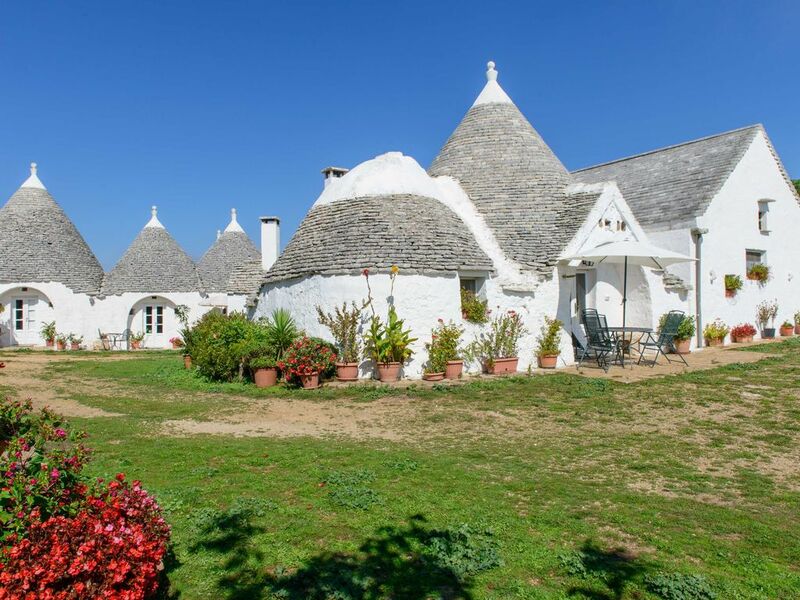 It is composed of a group of 16 Trulli, in which guests stay, the Casa Padronale, surrounded by large areas of land intended for grazing and a large oak forest. It is the countryside of trulli and olive trees, dry stone walls and ancient oaks. The Pozzo Tre Pile farm house takes its name from the presence of three large "shapes" surrounded by wells and "piles". In these styles are evident traces of ancient techniques for collecting water, a particularly valuable asset in an area that offered little: only rainwater. The shapes are in fact cisterns dug into the calcareous rock, in the points further downstream where water from the upstream soils could be conveyed more easily than were often terraced to stop erosion, channeling water to the points where It serves. Several perimeter wells and a certain number of "piles", made of large stone of hollow stone, surround these cisterns. The water collected in the stacks was used to water the animals, to water the gardens. In the "Pozzo Tre Pile" farm there are still three styles of which two inside and one along the road. The carters, in fact, who traded resources of our land, such as wine, oil, wheat, but also the peasants, shepherds, the travelers, quenched their thirst, fed their beasts and after a short stop they set off on the dusty roads to reach the inhabited centers. The masseria, from the Latin mass, or "set of funds", is a rural building settlement typical of the seventeenth and seventeenth centuries, which represented for a long time the type of farm, agricultural-pastoral, more widespread in Puglia; it could be defined as a self-sufficient, self-sufficient system, where nothing needed for the primary needs of its inhabitants, starting from the water, ending up in the oven for baking bread, the "palmento" for the pressing of the grapes and the fermentation of wine, the olive press crusher. Each farm has a single large central space, also with the function of aia, on which the entrances of the various buildings of residence and work, surrounded by a fence, consisting of a high and fortified wall, with a large entrance door, barred by a sturdy door, which allowed access to the large courtyard also to carriages and transport carriaggi. Generally in one part of the building lived the owner and his family, others were used for the housing of peasants and stores of supplies. Inside the courtyard there were also stables for horses or mules or cows, as well as rooms for goats, sheep, chickens, rabbits and various breeding birds. Other rooms were used for the storage of work tools, forages for fodder and crops. If in Puglia the farms represent the great landed property, the dry buildings like the trulli, testify to the existence of the small peasant property. Next to the dry stone walls typical of the Salento countryside and the beautiful trulli of the Valle D'itria, we find Pajare, Lamie, Casedde and Furneddhi. Made with very thick walls in order to ensure a good preservation of the heat inside during the winter and a pleasant cool in summer are unrepeatable testimonies of rural wisdom.